A flock, a gaggle of tweeters? 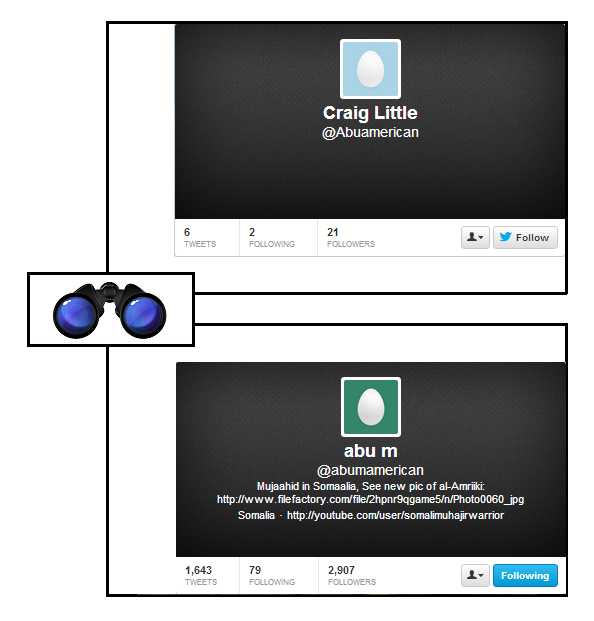 It is pretty clear, I think, that Craig Little (upper panel) is not a mujahid from Daphne, Alabama, now living or dead in Somalia. He first tweeted on 22 March, 2009, however, and hasn’t tweeted since 29 July, 2010. 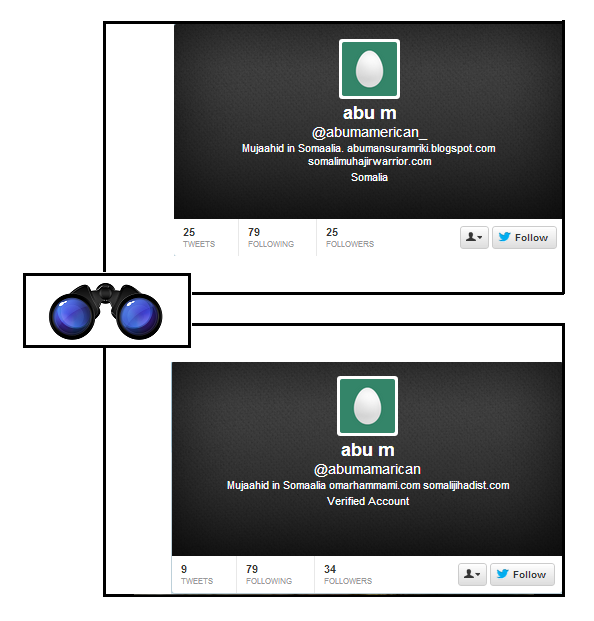 Which gives him the name AbuAmerican on twitter. 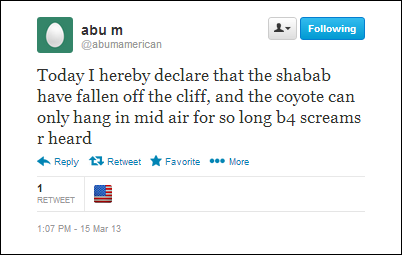 Abu M, however, came later, first tweeting on May 15, 2012, and most recently on May 3, 2013. He has the Twitter handle AbuMAmerican, and is generally regarded as being the mujahid from Daphne, Alabama, Omar Hammami — of whom one might ask, is he in heaven, is he in hell, that demmed, elusive Pimpernel? Or still in Somalia, perhaps, dead or alive? Depending on what one believes about life, death, and beyond. Both these gents — the one with an “a” where an “e” would otherwise be, and the one with an _ at the end of his handle, as though you might need to crank a car with it — purport to be picking up where AbuMAmerican left off. AbuAmerican_ with the crank handle is followed by Jarret Brachman, J. Dana Stuster, Khanserai, Peter Neumann, and Raff Pantucci among knowledgeable others — Raff also follows AbuAmarican with the improper “a”. And how’s this for complicated? AbuAmarican with the “a’” is followed, too, by the frankly cranky AbuAmerican_, by Chris Anzalone, IntelGirl, DC Gomez and Christof Putzel. Putzel, in case this is any help, interviewed Hammami in 2012 for CurrentTV, long before Spencer Ackerman talked with him for Wired this April. If it’s a hoax … it’s an incredibly elaborate one, and would be done for an extremely small audience. Who’s Who? How should I know?